Ferris was commissioned lieutenant on 9 September 1778, being placed in command of the Lowestoffe’s Prize at Jamaica by Rear-Admiral Sir Peter Parker, which vessel he was still commanding in the following year. He was promoted commander on 22 November 1790 along with many other officers at the end of the Spanish Armament, and in March 1791 he commissioned the bomb Vulcan 8, paying her off six months later at the end of the Russian Armament. In October 1792 he recommissioned the sloop Scorpion, going out to Africa in the following month and visiting the embryonic colony of Bulama before sailing for Barbados. On 14 October 1793 Ferris was posted captain, and he immediately recommissioned the dull-sailing Inflexible 64 as a storeship at Chatham, initially serving in the Downs. In January 1795 she arrived at Cork with a convoy from Cadiz, and in February departed Portsmouth with another convoy for the Downs. During the summer she was re-armed as a 64-gun vessel, and she sailed north to join the Leith squadron in November, seeing further service in the North Sea. His ship was one of the last three surrendered by the mutineers following the insurrection at the Nore which broke out in May 1797, and in December he sat on the court-martial at Sheerness of Captain John Williamson of the Agincourt 64 for neglect of duty at the Battle of Camperdown. Thereafter he continued to serve in the North Sea and the Downs, and in July 1799, with the Inflexible fitted out as a troopship, he sailed for the Baltic with a commodore’s broad pennant in command of a small squadron that transported Russian troops to partake in the Netherlands campaign. The Inflexible was then paid off at Chatham in October. Ferris’ Hannibal lays grounded and dis-masted at the Battle of Algeciras, prior to her surrender. At the beginning of 1800 Ferris was appointed to the Ruby 64, and on 19 February he departed Plymouth for the Cape with sealed orders. Whilst in passage at the end of March the Ruby joined Captain Sir Charles Hamilton of the Melpomène 44 at Porto Praya in the Cape Verde Islands, and in the course of searching for three French frigates they took the French possession of Gorée in April. 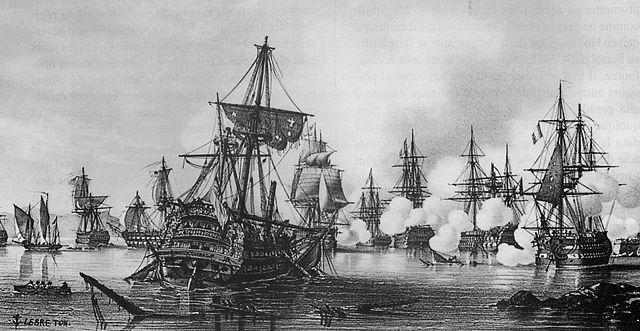 Having collected two Bombay merchantmen from St. Helena in May, Ferris captured the Bordeaux-based privateer Fortune 22 on 14 July whilst returning to England, and his command arrived back at Sheerness on 9 August. In March 1801 the Ruby entered Chatham for repairs, whereupon he left her. Later in March 1801 Ferris recommissioned the Hannibal 74, sailing from Portsmouth for Plymouth in June, and joining Rear-Admiral Sir James Saumarez’ squadron which went out to Cadiz. At the Battle of Algeciras on 6 July he surrendered this vessel to the Spanish, having grounded in a boldly assumed position where she was raked mercilessly with the loss of eighty-one men killed and sixty-two wounded, and with both her mizzen and main masts shot away. He was taken prisoner, but exchanged on parole following the visit to Algeciras under of a flag of truce by Captain Jahleel Brenton. After returning to England on a lugger and being landed at St. Ives at the end of July Ferris proceeded to the Admiralty in London. He was subsequently tried for the loss of his ship aboard the Gladiator 44 at Portsmouth on 1 September 1801, Rear-Admiral John Holloway presiding, but not surprisingly was most honourably acquitted, his conduct being described as ‘brave, cool, and determined.’ Days later he assumed command of the Thunderer 74 at Blackstakes, which he paid off at Chatham at the beginning of November. In the summer of 1802 Ferris was appointed to the Hercule 74, which in January 1803 was ordered to be fitted out and provisioned at Portsmouth for foreign service. Departing in early March, he arrived at Guadeloupe at the beginning of April, and after proceeding to Jamaica he assumed the position of senior captain. Sadly his tenure proved to be of a very short duration, for he died aged 54 after a two-day illness at Port Royal on 26 May 1803, Lieutenant Archibald Hills assuming the acting command. A wall tablet commemorating Ferris was placed in St. James Church, Southwick, Hampshire, in which parish he had lived. His widow, Esther, died on 13 April 1849.